General Mills has announced it will start labeling products with genetically modified (GMO) ingredients, becoming the second major food company to make the transition following Campbell Soup’s decision last month. The news comes as another blow to Big Food following the Senate’s rejection of Sen. Pat Roberts’ (R-Kan.) Safe and Accurate Food Labeling Act (SAFE) Wednesday. The bill, dubbed by opponents as the Denying Americans the Right to Know (DARK) Act, would have prevented states—namely Vermont—from requiring labeling of GMOs and stopped pending state laws that require labeling to go into effect. Jeff Harmening, head of General Mills’ U.S. retail operations, addressed the national GMO debacle in a letter and explained that since his cereal company will be forced to label GMOs in Vermont by July 1—which is when the state’s labeling mandate takes effect—it should also extend GMO labeling to products sold across the nation. I have been eagerly awaiting a resolution of the GMO labeling debate in Washington and am disappointed that a national solution has still not been reached. As the discussions continue in Washington, one thing is very clear: Vermont state law requires us to start labeling certain grocery store food packages that contain GMO ingredients or face significant fines. We can’t label our products for only one state without significantly driving up costs for our consumers and we simply will not do that. The result: consumers all over the U.S. will soon begin seeing words legislated by the state of Vermont on the labels of many of their favorite General Mills products. The Cheerios maker’s announcement was praised by GMO labeling proponents. Scott Faber, the Environmental Working Group group’s senior vice president of government affairs, said the decision reflects the sentiment of the majority of Americans who want to know if they’re eating GMOs. General Mills has shown real leadership by committing to provide consumers basic information about their food. More than 60,000 consumers thanked Campbells when they announced their commitment to greater transparency, and I am sure consumers will reward General Mills for trusting consumers to make their own choices. I applaud their leadership for recognizing that consumers simply want to know what’s in their food and how it’s grown. Senators on both sides of this issue now need to realize that the market place is moving far faster than our legislators, and that the time has come to enact uniform mandatory legislation that makes it easy for consumers to see at a glance whether their foods contain GMOs. If large companies like General Mills and Campbells are accepting that this is what consumers want, then so should our political representatives. It is now time to put this debate behind us and realize that the citizens have spoken. Besides Campbell Soup, a number of major American companies, such Ben & Jerry’s, Chipotle and Whole Foods have either abandoned GMOs or require labeling. Coincidence or not, Campbell has also seen its stock price rise in after making its announcement to ditch GMOs. 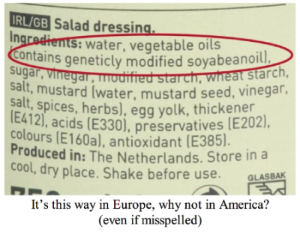 According to Green America’s GMO Inside, General Mills’ food products are “chock full of corn, soy and sugars—ingredients that are almost always genetically modified in the United States,” including America’s favorite cereal, Cheerios. The labeling of GMOs has been a contentious food fight in recent years. Food and beverage trade organizations such as the Grocery Manufacturers Association (GMA), which represents more than 300 food and beverage titans, argue that a 50-state patchwork of GMO labeling policies would be prohibitively costly. However, as EcoWatch exclusively reported, despite the GMA slapping numerous lawsuits and spending millions in lobbying against mandatory labels at the state and federal level, an internal document indicates that GMA member companies are preparing a transition to labeling their GMO products, or at least in Vermont.